Heart-shaped lockets come in many styles and designs perfect for gifts, keepsakes, or just because. Store a picture in it of someone close to your heart, a birthstone or even a small piece of paper with a poem or prayer on it. While a plain, classic locket is an elegant piece of jewelry, there are many other options for special occasions. Some designs may even give hints about their secret contents. Click any photo for retail information. A single small diamond or diamond chip inset into a heart locket gives it a tiny bit of sparkle and makes it distinctive. For the best effect, choose matte or brushed metal lockets with these small diamond accents so the stone's brilliance will stand out. A vintage-inspired locket may integrate detailed filigree designs which accent a single colored gemstone accent. This is a beautiful option for antique-themed jewelry, and the gem can be any color or shape. A relatively plain heart locket can be instantly elegant if a contrasting appliqué is added. If the locket has border embellishments, it can give the appliqué even more eye-catching beauty. There are many textures that can be found on heart shaped lockets, including etchings, engravings, and different finishes. A quilted look is a unique option that gives the locket a thicker appearance and can represent a warm blanket to protect the heart and the love in the locket. Heart-shaped lockets are a popular romantic gift, particularly designs that incorporate the word "love." Script lettering, engraving, and etchings on the outside of the locket are all popular. You can also find designs where the inside of the locket is engraved with a private romantic message. Edging the heart with diamonds or crystals is a great way to add that extra something special to a locket. These are popular designs available at a wide variety of retailers. A family heart locket with two stylized parents is a unique and symbolic gift for a mother or grandmother. 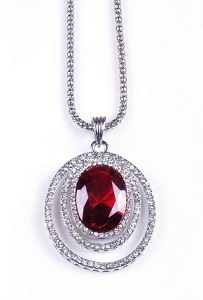 Small birthstones can be placed into the locket to represent all family members in an elegant and colorful way. A heart locket completely paved with gems is a glittering piece of jewelry that will turn heads. The diamonds or crystals may be set into patterns to simulate vintage jewelry pieces or Art Deco styles, or they may be arranged in a smaller, simpler pave design. A heart locket with a cross is a popular piece of jewelry to celebrate one's faith or to keep a lost loved one close. Flowers, angels, doves, and other symbols may also be part of the design, and the interior may be engraved with a favorite psalm or Bible passage. A heart-shaped locket with a stylized mother and child is a perfect gift for Mother's Day. To make the gift even more special, enclose a small photo or lock of hair in the locket. Other motherhood-themed lockets may also include roses or additional hearts in the design. There are a lot of fun designs that can be found on the face of heart lockets. Bows, cats, angels, flowers, paw prints, and stars are all popular designs, and these cute lockets are great for young girls. A heart-shaped locket with a classic cameo angel blends traditional jewelry with modern appeal. This is perfect for a baptism, christening or as a gift to a god child. Choose a blue cameo to represent a male child, or a pink or peach one for a female child. Show the world that you're lucky in love with a heart locket embellished with clovers. This is a fun design to wear for St. Patrick's Day or whenever you want to show a little Irish spirit. Even if you can't find a heart-shaped locket you like, there are plenty of other locket shapes that incorporate hearts in the design for the same romantic, loving symbolism.